Chicken Wontons with Apricot-Soy Sauce | "Il faut goûter"
Next time you’re at a grocery store, pick up some wonton wrappers. You can stuff the little guys with nearly anything edible, fry them in oil, and you’ve got three bites worth of delicious. A tasty dipping sauce will make them sublime. 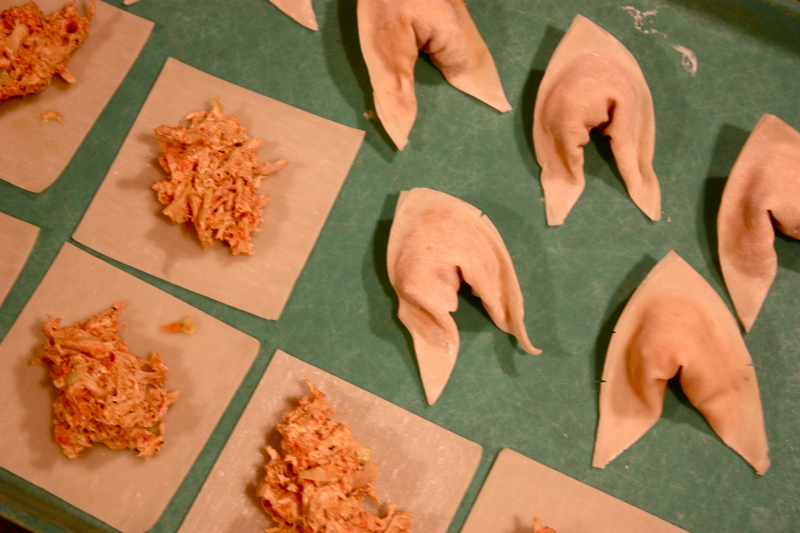 I’m on my third-ever wonton kick; tonight the filling was chicken-based and the flavor profile was Asian. Make these, or experiment yourself! 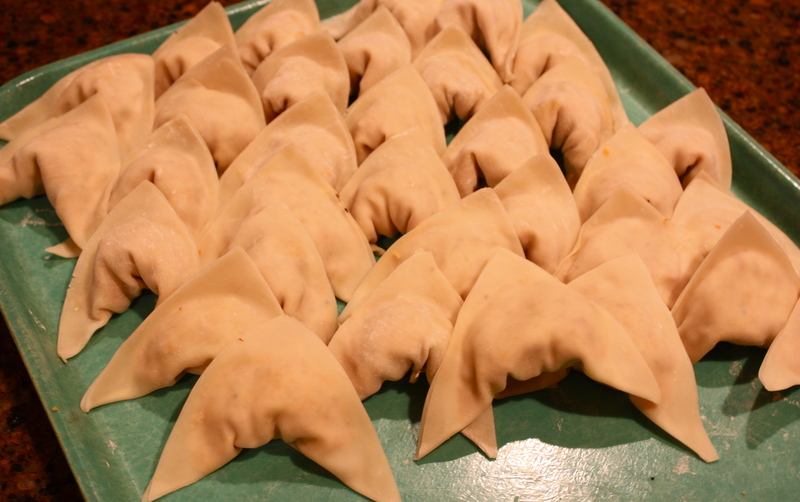 And expect more wontons from me soon. Pulse carrots, onion, and bell pepper in a food processor or chopper until very fine. Heat the oil in a skillet and sauté the carrot/onion/pepper mixture until carrots are a bit soft, 10-15 minutes. Add the garlic, black pepper, and cabbage and sauté until the cabbage softens and slightly wilts, 5-10 more minutes. Remove from heat and pour into a bowl with the shredded cooked chicken. Stir in the soy sauce, lime juice, ginger, vinegar, and cayenne pepper. Cut the cream cheese into chunks and stir and mash until the cheese is incorporated with the chicken and vegetables. Spoon about 1 tablespoon of mixture into each wonton wrapper. Have a bowl of water nearby. 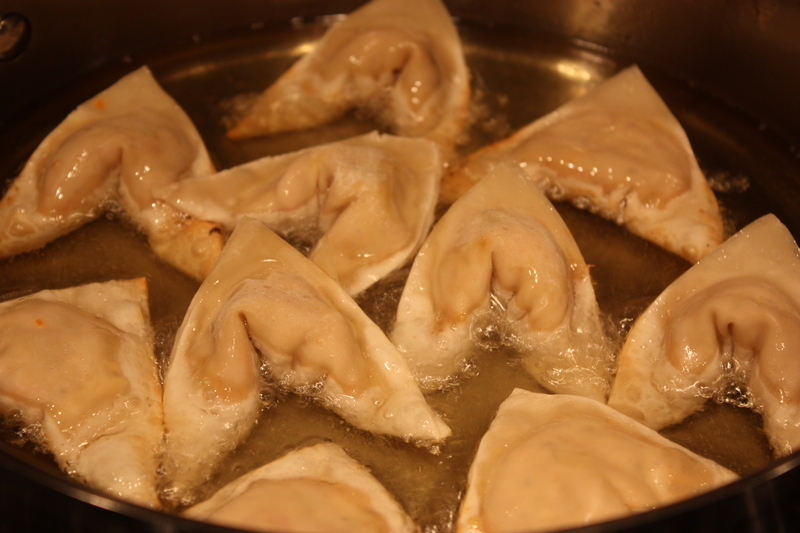 For each wonton, wet your finger and spread water around the edges of the wrapper and fold in half into a triangle, mashing the edges together to seal. Fold the two corners of the base of the triangle down toward each other, being careful not to crack the wrapper or break the seal. 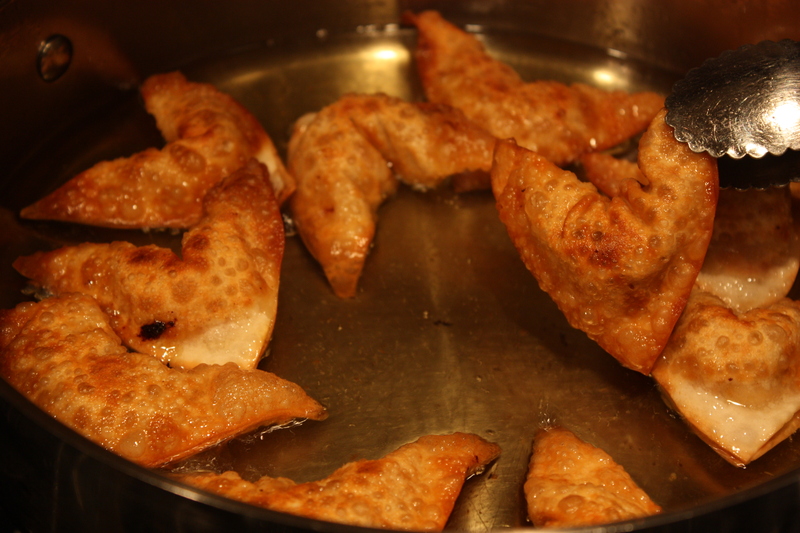 Fry the wontons in about 1/2 an inch of hot oil, turning once, until golden brown. Serve with this Apricot-Soy Sauce (below) or another favorite Asian-inspired sauce. Mix all ingredients except cornstarch/water mixture in a saucepan over medium heat. Bring to a low boil and stir in cornstarch/water mixture. Simmer until thickened to your liking. Mine had a slightly syrupy consistency. Taste as you go and adjust sweet-/saltiness to your liking with more or less sugar or preserves and soy sauce. 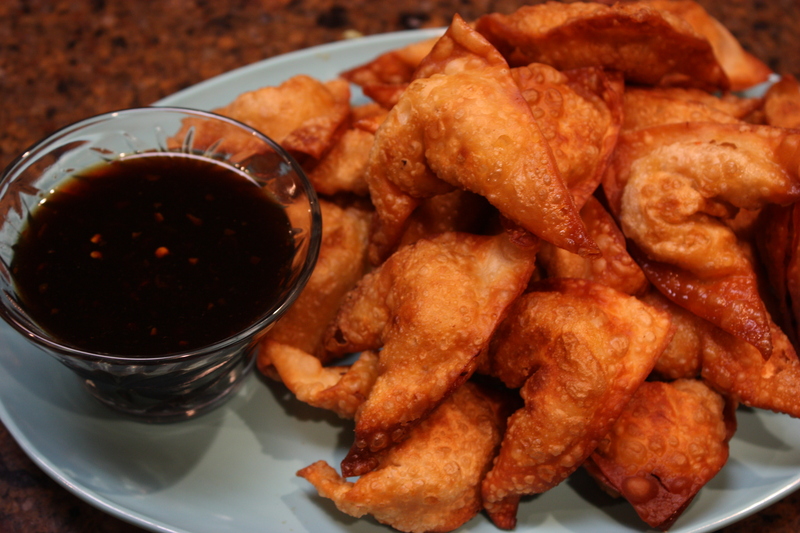 This entry was posted in Savory and tagged apricot-soy dipping sauce, chicken wonton, food, recipe, wonton wrapper by needtotaste. Bookmark the permalink. These look insanely tasty. Love the photos too, especially the deep-fry close-ups. Thanks very much, and yup they’re quite tasty! Glad you enjoyed the post! Al–these are great. Looking forward to more fillings in these crunchy, little wraps. Oh my gosh…! This sounds so amazing!! Those look absolutely perfect and that brunch above oh man!